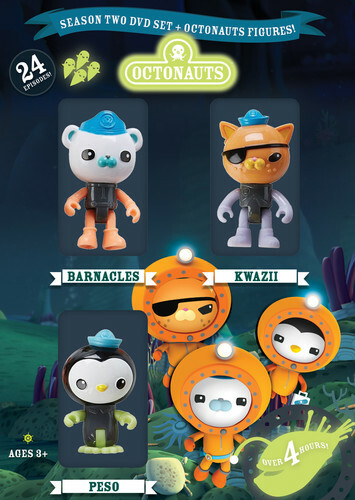 Octonauts: Season Two (With Figurines) on DVD Deluxe set includes three bendable figures. Two DVDs. Dive into adventure with your favorite underwater explorers, the Octonauts! Join brave Captain Barnacles, daredevil ex-pirate, Kwazii, medic Peso Penguin and the rest of the crew, as they explore the world s oceans, rescue the creatures who live there and protect their habitats - above and below the waves! Based on the richly imaginative books by Meomi, this series combines immersive visuals and 'submersive' humor to transport young children into a world that is both real and fantastic, full of mysteries to unravel and surprises around every corner. In this season set, encounter all types of creatures from the Great White Shark to Lionfish and more! The adventures don't end there! Embark on an Amazon adventure with the Octonauts as they travel down the Amazon River in search of a lost city and Kwazii's long lost grandfather, Calico Jack! So, come aboard the Octopod for 24 exciting missions! I want to win for my friend's daughter. My younger grandkids love the Octonauts! We bought them some of the Octonaut toys for Christmas last year. This is a real cute cartoon!